We are accepting volunteer and staff applications. Check out the dates to sign up online. Please contact Joe to be added to the camper wait list. For questions about groups, buses, the Orc program, and camp activities, please contact Ben. To join the wait list, or for questions about registration and payment, please contact Joe, (770) 633-7698. 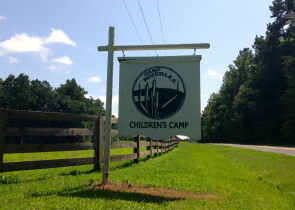 Camp Riverlea is located at 8302 South Lowell Road, Bahama, NC 27503, about 10 miles north of Downtown Durham. From the south, head north on Guess Road. After crossing St Marys Road/Mason Road, go 1.3 miles and turn right on South Lowell Road. Camp is about half a mile down South Lowell Road, on the right. Go all the way to the end of the driveway, where you’ll see a big building and a playground. For information about our bus transportation and bus stop locations, click here.